Heavy firepower and grim determination will take you a long way in life, I'm told, but sometimes you need a little something extra to make it through the storm. An ace in the hole. A specialist. And when that "sometimes" is an imminent power-armored zombie apocalypse, there's nothing and nobody better to have at your side than the man they call, simply, Bruce. Of course Bruce isn't really called "Bruce" in the new undead-flavored Call Of Duty DLC—he is in fact Captain Lennox, a pilot for Sentinel and, by all appearances, a fairly generic videogame bad guy—but I think it's fair to say that he is always Bruce, in one fashion or another. And so here we are, with dreams of "Gimme some sugar," and fingers crossed that Activision gives him all the scenery to chew that his imperious chin can cope with. 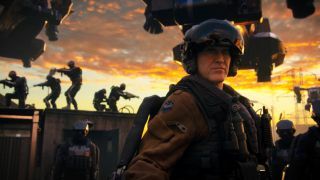 The Call of Duty: Advanced Warfare Supremacy DLC pack features four new multiplayer maps, plus new weapons, traps, and a brand-new playable character. It comes out tomorrow for the Xbox crowd, and about a month after that (or so I'm guessing) for the PC. Find out more at CallOfDuty.com.